ALONG WITH THE HOLIDAYS come friends, family, and holiday treats! Here are a few guidelines to keep your smile and braces in tiptop shape. Steer instead towards softer holiday treats like soft sugar cookies, pumpkin pie, or fudge. And always brush afterwards. Take time on each individual tooth. 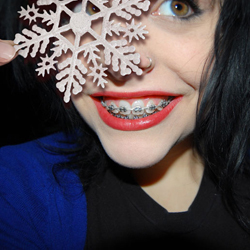 Pay careful attention to the areas where your braces touch your teeth. Brush at an angle. This allows your toothbrush to reach the space between teeth and braces. Be prepared. Keep a toothbrush, toothpaste, and floss with you in your backpack or purse. We Want to Wish You Happy Holidays! We sincerely appreciate having you as our valued patient and friend. Even if you don’t have an appointment, stop by to say hello during the holidays! Or, say hello on our Facebook page! Top image by Flickr user Zoe used under Creative Commons Attribution-Sharealike 4.0 license. Image cropped and modified from original.